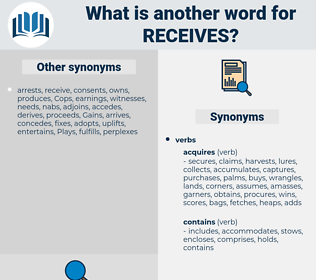 What is another word for receives? refuses, welcomes, captures, draws, Faces, meets, makes, Awarded, secures. 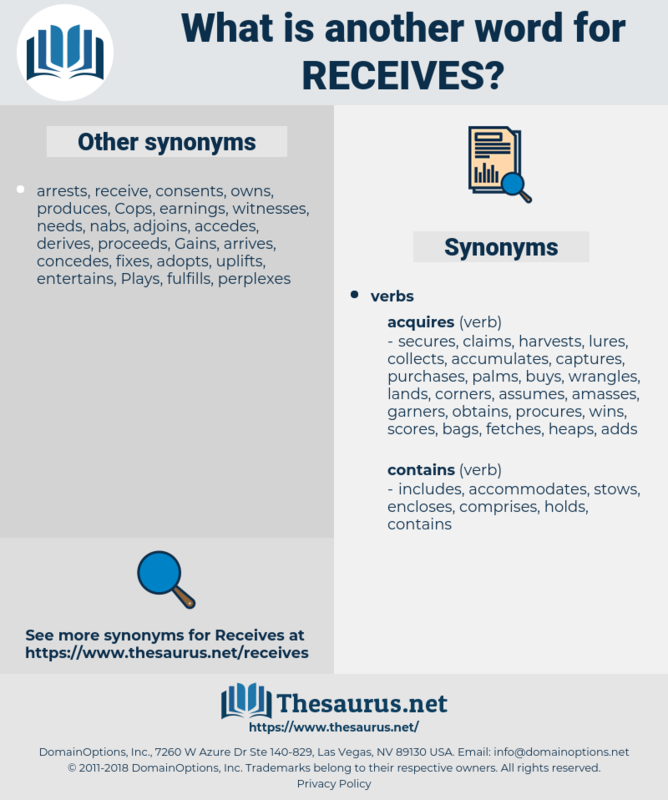 recipients, receptions, shipments, inputs, cases, Does, trains, sounds, Has, looks, feels, stands, makes. perceives, retrieves, derives, arrives, recieves, removes, acquires, collects, deserves, incorporates, earns, Gives, elicits, reaches, recognises, suffers, registers, delivers, serves, recognizes, approves, Records, gathers, moves, retains, Leaves, covers, appreciates, experiences, renders, attracts, introduces, beneficiary, comprises, where, contributes, accrues, represents, creates, requires, remits, produces, integrates, preserves, provide, provides, exists, harvests, embraces, relies, forward, forwards, withholds, very, intervenes, constitutes, generates, invites, merits, accepts, catches, reflects, acknowledges, reminds, greets, afflicts, refers, submits, entitlement, transmit, transmits, realizes, Filings, originate, originates, realises, Securing, brings, allocates, accommodates, prescribes, Charges, views, communicate, Communicated, contains, learns, support, supports, impinges, responds, Comes, expects, hears, IMPACTS, lies, investigates, deducts, proceeds, purchases, undergoes, infects, caters, presents, absorbs, discloses, establishes, fires, qualifies, concerns, commends, Affects, encompasses, observer, attained, attains, Carries, consumes, possesses, treats, reads, Addresses, pertains, includes, imposes, results, compiles, sensitivity, Grants, favours, listens, right, raises, pays, envisages, withdraws, sends, maintains, nears, expresses, harms, occupies, uses, understands, builds, hurts, regards, involves, species, entails, performs, yields, follows, Levies, shares, emerges, seizes, Tracks, corresponds, arises, seeks, opens, arouses, becomes, agrees, identifies, considers, consists, offers, feeds, specifies, stipulates, admits, awards, discusses, assigns, confronts, Droit, straddles, prompts, monitors, stores, entrusts, claims, ensures, succeeds, enrols, finds, extends, touch, touches, owns, operates, causes, holds, devotes, Strikes, engages, commands, disposes, adopts, underlies, paras, profits, selects, declares, adds, notes, exhibit, boasts, belongs, applies, determines, ranks, combines, crosses, throws, places, highly, works, poses, Bears, sees, features, relates, buys, Houses, objects, employs, spends, Lends, decides, pervades, fills, manages, foresees, marks, assures, starts, shows, intends, attaches, permeates, lays, needs, Tests, leads, falls, imagines, handles, examines, states, helps, Accorded, accords, wishes, warrants, hits, puts, allows, Focuses, shoots, upholds, cashes, assesses, bids, unites, tug, outputs, casts, logs, happens, up, stems, keeps, tends, whip, counts, says, knows, passes, defines, calls, goes, law, deals, cuts, senses, pulls, account, accounts, means, thinks, acts, Bases, runs, Does, sounds, sheds, Has, looks, feels, stands, Him, welcomes, captures, draws, Faces, meets, makes, secures. If there be truth, that truth must be itself - must exercise its own blessing nature upon the soul which receives it in loyal understanding - that is, in obedience. Whoever receives it must instantly throw it to some one else, and so on, while the person in the center endeavors to catch the handkerchief in its passage from one player to another. raspy, rig up, recipe, rugby, recife, rosebay, rajab, Reship, reshape, rosehip, rake-off, rose hip, rosy boa, rise up, recap, rough up, rasp, recopy, re-equip, raise up, rechauffe, rough pea, rack up, rose bay, rake off, rake up, recessive, rush off, recoup, ruck up.